Apple’s most potent MacBook Pro may have a cooling problem, but blame for the toasty Core i9’s throttling may not lie entirely at the Cupertino firm’s door. The 2018 MacBook Pro offers a six-core Core i9 processor for the first time, one of Intel’s fastest CPUs, and instantly became an object of lust for those wanting workstation performance from a portable machine. Power, though, isn’t delivered in isolation, and there are inherent challenges for putting desktop-class processing in a slimline notebook. Most commonly that means heat. As anybody who has heard the fans in their laptop spool up to turbine-like levels, and felt the underside get uncomfortable hot, will know, the challenge every portable computer faces is dealing with heat. That, according to early MacBook Pro feedback, is a challenge Apple’s new machine may not be handling as smoothly as we hoped. Signs of concern were first raised by YouTuber Dave Lee, who found the Core i9 version of the 2018 MacBook Pro encountered some serious issues when running video editing app Adobe Premiere. Far from delivering a big uptick in performance versus the old notebook, Lee found the new laptop quickly began to get very hot, and then throttle back its processor significantly. Indeed, he found the chip couldn’t maintain its 2.9 GHz base clock speed, instead coming in at on average 2.2 GHz when under load. The problem is the so-called Thermal Design Point, or TDP. It’s Intel’s rating of how much heat power its processors dissipate when they’re running at their base clock speed, with all cores active, and under a high workload. A higher TDP typically means more performance – since faster cores give off more heat as a byproduct – but also demand more provision for cooling. 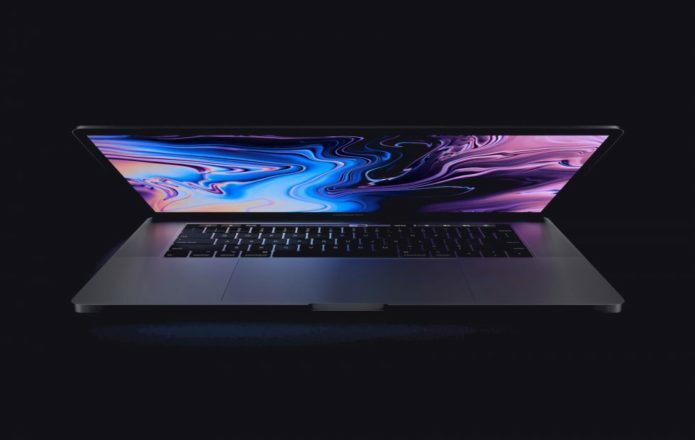 A low TDP processor, for instance, means that Apple’s 12-inch MacBook can be fanless: the ultraportable can dissipate the heat from its CPU through passive methods, but it also means that the laptop’s performance is relatively conservative. A high TDP processor, meanwhile, requires active cooling. That typically means a combination of heatsinks and fans, though performance notebooks intended for gaming and other such system-intensive activities can also make use of heat-pipes, liquid cooling, and other increasingly complex methods to deal with the heat levels involved. When designing a laptop, therefore, a balance has to be struck between design, aesthetics, and cooling. Big cooling systems can handle bigger TDPs, but also result in larger, less portable notebooks. Slimmer designs, meanwhile, could struggle with those higher TDPs. One prominent suggestion about the new MacBook Pro, therefore, is that its cooling provisions simply weren’t up to the challenge of the highest-performance the Core i9 is capable of. Teardowns of the new notebook seem to show that the design is pretty much the same as for the older, slower versions. The Core i7 chips that Apple is also offering, meanwhile, also have TDP of 45 watts. However, their Turbo Boost speeds are lower, suggesting less heat will be involved. The question, therefore, is just how much heat during Turbo Boost Apple designed for, and that’s based in no small part on what sort of TDP and beyond that Intel told the Cupertino firm was realistically on the roadmap. Adding to the situation is the fact that the 15-inch MacBook Pro shares its cooling system between both the CPU and the GPU. That means, in situations where both chips are being stressed, there’s more chance again of the cooling being overwhelmed. When that happens, the laptop automatically throttles down its cores for safety and stability. How much you might see that will depend on what sort of tasks you’re expecting your notebook to perform. If you’re running video editing apps like Adobe Premiere, for instance, you’ll be pushing both the CPU and the GPU hard, and more likely to run into thermal issues. If, however, you’re using apps which focus on the CPU, you might not have such a problem. Geekbench ran a custom stress test with its benchmarking tool on a Core i7 version of the 2018 MacBook Pro, and found that “even under sustained load, the i7 processor was running at 3.0-3.1 GHz, well above the processor’s base frequency of 2.6 GHz.” That’s because Geekbench’s app only uses the CPU. It seems unlikely that anybody in the market for a MacBook Pro – particularly the new Core i9 configuration, which starts at $2,799 – would be unfamiliar with the idea of a computer slowing when under significant load. All the same, the notebook wears its performance numbers clear on its sleeve. The 2.9 GHz clock speed, and 4.8 GHz Turbo Boost are headline features, after all. There are a few routes by which Apple could work to at least partially address the issue. For a start, it could opt to have the cooling fans ramp up sooner, working to dissipate more of the heat before the system reaches the point where it needs to throttle back. Alternatively, it could tinker with the maximum temperature settings, allowing the CPU to remain hotter before throttling, or adjusting how the Turbo Boost performs. It’s unclear just how much of a difference each of those changes might make, either to cooling, system performance, or battery life. Anything more significant, though, would presumably demand hardware changes that would seem, right now at least, beyond the scope of what Apple would like to attempt. Certainly, though, it’s something the company has to be thinking about. This isn’t the first time thermal load has raised its head as a challenge, after all. Back in 2017, Apple execs conceded that they’d placed their bets on the wrong horsewhen it came to the Mac Pro, figuring when the cylindrical workstation was designed that the graphics industry would follow a trend of multiple GPUs. Instead, it was single, large GPUs working under high loads that became popular, but with which the Mac Pro’s cooling system simply couldn’t keep up with. For the moment, Apple is tight-lipped on the Core i9 cooling question. Firmware updates to handle how processor overclocking is handled may well arrive in due course. For potential buyers, keeping in mind the thermal realities when you want a performance notebook that’s also portable seems sensible, not to mention knowing exactly what you want to do with your new mobile workstation. That’s a thought process most professional users probably weren’t expecting to have to make, and proves life at the cutting-edge seldom goes smoothly.